Home > Current Buzz > Luis Salgado (Fame on 42nd St) Directs DC-7 at the Puerto Rican Traveling Theatre Co.
Director, Choreographer and Performer Luis Salgado is up to another creative year. Now in rehearsals for The Off Broadway Engagement of DC-7, The Roberto Clemente Story, written and directed by Luis Caballero. Luis Salgado is thrilled to be merged into a creative year that includes a children musical in collaboration with Tony Nominee Joshua Henry titled "Amigo Duende", The re-creation of his Show "Candela Fuerza y Pasion" in Lima Perú, directing and choreographing "FAME" the musical in Latin America and the opening next week of the Off-Broadway version of Puertorrican National hero Roberto Clemente. "For me this is it!" says Luis Salgado "The joy of my life is to be merge in art and after taking time to sharpen my creative work studying with SITI Company and being guided by professors like Jack Hofssis and examples like Serio Trujillo and Andy Blankenbuehler I feel empowered to exercise and share my visions, ideas and my heart in many ways. I am thankful and thrilled to be telling stories that contribute and moves communities through the arts"
The Society of the Educational Arts' smash hit production of DC-7, The Roberto Clemente Story begins a limited Off Broadway engagement on February 14th, following a sold-out run last Fall in Lower Manhattan. 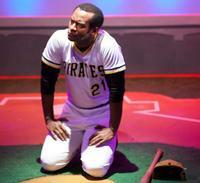 The show about the life and legacy of baseball legend and humanitarian Roberto Clemente (first Hispanic inducted into the Baseball Hall of Fame) will play at its new home, the Puerto Rican Traveling Theatre (304 W. 47th Street), through April 8th. Performances are Thursdays, Fridays and Saturdays at 8PM, Sundays at 3PM. Modesto Lacén (Off Broadway's Celia and La Barbería) will reprise his acclaimed performance as Clemente, with Lorraine Vélez (Broadway's Rent), Dr. Manuel A. Morán, and Josean Ortiz also reprising their roles as Clemente's wife Vera, his friend Ramiro Martinez, and his brother Matino, respectively. The creative team is also transferring to Off Broadway: Chroreography and Musical Staging by Luis Salgado (Broadway's In The Heights, Women on the Verge of a Nervous Breakdown). Music and Musical Direction by Harold Gutiérrez. Set design by José López. Costume design: Harry Nadal (Assistant Designer, Broadway's The Capeman). Directed by Luis Caballero (La Lupe, La Gringa, El Olor de la Guayaba). The Off Broadway engagement is co-produced by Teatro SEA, The Puerto Rican Traveling Theatre (Founder and Artistic Director Miriam Colón) and The Rivera Mercado Marketing Group (John "Gungie" Rivera and Ralph Mercado III). DC-7 is a bilingual (English/Spanish) musical that transports audiences to Clemente's early years in Puerto Rico, his time with the Montreal Royals and his record-breaking, 18-year tenure with the Pittsburgh Pirates. The show also dramatically depicts the era of the Civil Rights Movement and how it impacted Clemente's life as a Black Hispanic. Through all his trials and tribulations, Clemente triumphed becoming a legend on and off the field. The musical played a sold-out run last November at Teatro SEA, in the Lower East Side. The production has recently won 6 Latin ACE Awards including Best Musical, Best Director and Best Book (Caballero), and Best Actor (Lacén). The show has now received 7 ATI (Independent Latin Theater Artists) Awards nominations. Roberto Clemente (1934-72) was one of the most beloved figures in the history of the MLB. He was the first Latino to win a World Series as a rookie (1960.) He also won the MVP Award (1966) and the World Series MVP Award (1971.) He finished his career with over 3,000 hits and 12 Golden Glove Awards. He was posthumously inducted into the Baseball Hall of Fame following his untimely death on December 31st, 1972 from a plane crash while traveling to deliver aid to earthquake victims in Nicaragua. Also featured in the cast are Anthony Cotto, María del Mar González, Omar Perez, Johanna Rodríguez, Xiomara Rodríguez and Fidel Vicioso. Tickets for DC-7 are $37.50 online and $47.50 at the Puerto Rican Traveling Theatre box office. Tickets for the February 14th Off Broadway Opening Gala, are $100.